The kitchen is the heart of the home so you need countertops that are both strong and beautiful. There are many options to choose from but there are three main reasons why granite countertops win over the other materials. 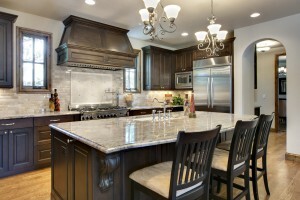 First of all, granite is an incredibly durable natural stone. Once it’s installed, the contractor puts a sealant on to protect the surface and keep bacteria away. That sealant means it is practically indestructible. You can do whatever work you need to on the counter without worrying about chipping or scratching the beautiful surface. For example, bacteria won’t settle on the surface since you can simply clean off the counter with ease. Feel free to set hot pots and pans directly on the surface, or cut vegetables without worrying that you’ll chip the counter. In fact, there is very little you can do to damage the stone, but even if it does manage to become scratched or chipped, it can easily be fixed. Without a doubt, one of the major benefits of adding granite countertops to your kitchen is that they increase the value of your home. As a material, it is highly sought after by homebuyers. So while it may not add monetary value to your home, it draws in more interested customers than laminate countertops. Lastly, granite is easy to clean and relatively low maintenance. The sealant keeps liquids from seeping into the stone, which means you can simply wipe up any mess and be done. All it takes is a soft cloth and some water with mild soap and that’s it. Kitchen countertops go through a lot on a daily basis. That’s why you need to remodel with a material that is durable, stunning and capable of withstanding the elements of a kitchen. Hire a professional contractor to help you select and install your new granite countertops today so you can have the best kitchen on your block.